Big news in the Procter family: we bought a house! So far we are loving our new city and our new neighbourhood. We bought in a central location near a river because we prefer to be in a walkable area with access to gorgeous views and lots of different shops (read: types of food). Our new ‘hood has train tracks, tugboats, bridges, and a heck of a lot of steep hills; my buns were burnin’ after a short stroller walk on moving day (and Hennie’s only getting heavier!). It’s only been a week in our new home but we are settling in well, unpacking, and making some plans for future projects (painting! renovations! adult stuff!). Since having Hennie in her own room I feel like we’ve gotten our lives back. The one-bedroom apartment we just moved out of was spacious, bright, and lovely, but our Hen is a very sensitive sleeper who wakes to seemingly innocuous sounds despite the white noise we put on to drown out general tomfoolery (see what I did there?). Cooking dinner or washing dishes in the evening often woke her up and reading in bed with a small light on was absolutely out of the question. In our new place we can actually talk to each other after she goes to bed at 6:30 (a game changer for our marriage?) and at long last I can read in bed again, a favourite past time that I’ve been missing for ten months. With our proximity to the riverfront, new parks to explore, and of course a brewery, hopefully we won’t be missing Vancouver anytime soon. 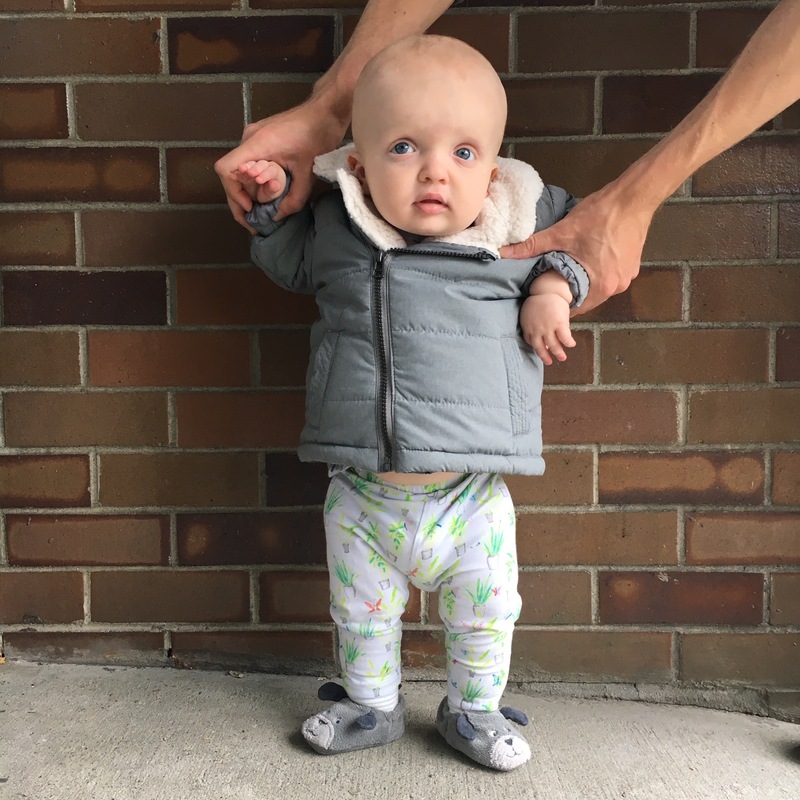 Miss Hennie James is ten months old and her personality is shining through in spades; she can be sassy, silly, clever, and cute – sometimes all in the same moment! Hen seems to know her mind quite a bit already (not sure which parent she may have picked that up from?) and we love watching her daily as she tries to solve problems and develop her new skills. Despite our suspicions that she has been continuously teething for the last month or more, she has been super smiley. Her new teeth are popping through all over rather than in pairs, so she has a bit of a jack-o-lantern smile at the moment (just in time for Halloween, I guess!). She is walking like a pro as long as she can hold onto something with one hand to steady herself, and loves to wave hello, high five, and clap her hands while saying “yayayayayayayayaya!” Hennie is still not saying “mama” or “dada,” not chewing her food very well (though she is very enthusiastic about solids), and has yet to master drinking through a straw; bottles and cups seem to perplex her a little, and her first instinct is to chew on things rather than use them for their intended function. The last two months we have seen Hen adapt to so many new environments and experiences as we travelled around BC and flew to England, but on her ten month “birthday” we moved into our first (owned) family home, complete with Hennie’s very own bedroom! Though we’ve only slept three nights in our new home, she has been napping and sleeping much better in her own space with less interruptions. Time is flying by and we intend to spend the next few months exploring the parks and river views in our new city.